Hello from Long Lane Honey Bee Farms. 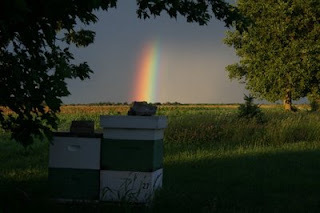 Today, we're taking a pause from our lessons and thought we'd have fun showing you what it's like in the real world of beekeeping because there's not a perfect hive at the bottom of every rainbow. 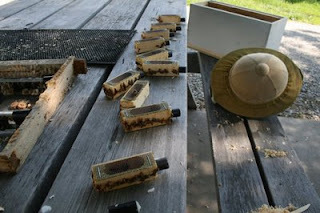 Most people's picnic tables don't have a beekeeping hat and veil, a nuc box and 10 queens ready to be shipped. This is what everything seems to look like around Long Lane Honey Bee Farms. 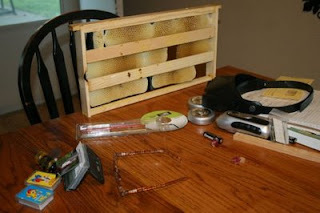 There are beekeeping items everywhere, and I do mean everywhere! Bees are our business and there never seems to be enough of us to go around. I find myself doing what I tell you never to do, work hives in the rain or late in the evening. Even though Jesus is perfect, we still live in a fallen world. Nothing is always perfect in beekeeping either. The other morning I woke up and noticed a queen bee on my wife's desk, just walking around. I guess the queen emerged from her cell, escaped out of her cage and walked out of the incubator. Or maybe by accident I left a queen cell laying around. Which gives me a good opportunity to share with you something my wife mentioned to me the other day. My wife mentioned that we do not want to give the wrong impression to people, that we have some huge, multi-building business with hundreds of employees and lab technicians walking around in white doctor coats in a bee lab. As I have said in previous posts, we are a family business, simple folks and that our operation is a functioning bee operation. The pictures probably make it look better than it really is. Probably all beekeepers who have a lot of hives are usually short on time to get everything accomplished. Certainly that is our situation. More than an occasional queen walking or flying through the house, my wife puts up with much more! Though she thoroughly enjoys bees and our bee operation, I'm sure she feels the bee business has invaded and taken over her home. We are currently revamping our old garage into a store/lab/learning center. Since it is only our family doing all the work, it is going slow. Any carpenters in Central Illinois that want to volunteer some work? But until that building is completed, most of our queen rearing operation is in our kitchen/dinning room. There is an incubator on my wife's desk, a fax machine and telephone system in my children's rec room and my basement is full of bee stuff, stuff like canning jars for feeding bees in the spring, entrance feeders and anything that needs to be kept out of the rain. Usually queen cages are scattered throughout the house. Cell bar frames lay around the kitchen counter and we are constantly trying to clean up propolis and honey drops. 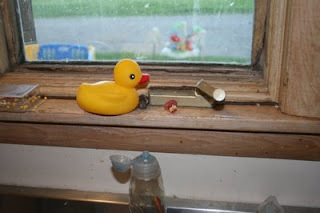 Queen cell cups in the window next to my baby's rubber ducky. 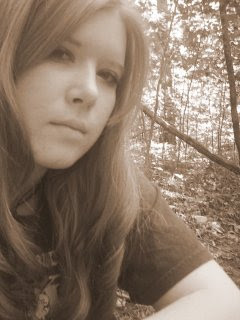 Oh, there is more, but you get the picture. And if I show anymore, I will embarrass my wife and myself. Before every meal, we have to clear away comb, frames, beekeeping magazines, grafting tools, flashlights, order sheets and a bunch of other beekeeping stuff. By the way, the frame in the picture is for banking queens until mating nucs are freed up. It just so happened that the bees took advantage of only 4 queen cages and put comb everywhere else. My wife does great chasing around after, Christian, our 10 month old and keeping our house clean and straight. 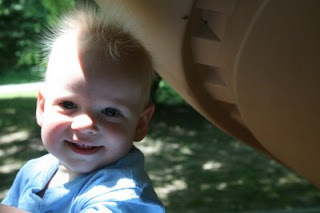 (Here's Christian after sliding down a plastic slide which gave his hair quite a strong electrical charge.) But clean and straight still means that I have to graft queens, and leave cell cups here until tomorrow and I can't move this or that until I'm ready to put it in here or there. If I were a rich man, and I'm not, I would buy a house somewhere else, and move there and drive over here to do all the bee work. Now the outside is even more of a challenge to keep everything organized and straight. There is bee stuff laying around everywhere. Don't get me wrong, it is important bee items, like feeders, queen excluders, feeding jars, bottom boards, lids, inner covers, tie-down straps, smokers, hive tools and on goes the list. Trust me it's EVERYWHERE!! But I really do use it and need these items on a regular basis. I even have much of the equipment stored in a storage facility. And then there are the active hives, hives and more hives! Hives surround my shed where we make hives. 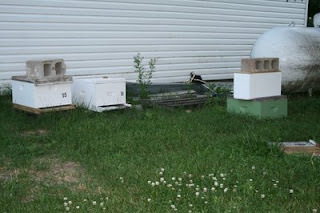 Queen rearing nucs are sprinkled throughout the yard. A row of queen rearing nucs take away from a beautiful spruce. I could move them further away on our 3 acres, but then I would have to walk further to work them. I have around 10 of these nucs which receive either virgin queens or queen cells and house the queens while they mate and until they are laying well. We recently had a bad thunderstorm knock down our power line, broke a power pole, and downed a large maple tree but these nucs withstood the storm just like they appear here, with no rocks, no tie-down strap or nothing! We praise God for protecting our queens! The yard! We have a real nice John Deere riding mower, but I can't bring myself to mow our yard because of all the clover! So we have some areas that look real pretty and other places look like no one has lived here in 5 years. My wife works hard to help me keep everything going and so do our children. My wife worked a full 8 hour day Saturday finishing the dry wall and painting our honey processing room. Wow, she did a great job, just in time for me to crank it up that night. To me, our honey room is a honey plant! 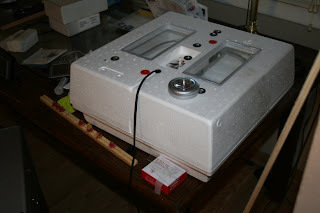 I've rebuilt a Cowen uncapper that uses motors, gears, chains and hot water to uncap honey frames. It can uncap both sides of 10 super frames in 60 seconds. Seriously, can you imagine uncapping both sides of 10 medium super frames in 60 seconds? I rebuilt a 33 frame, motorized extractor. 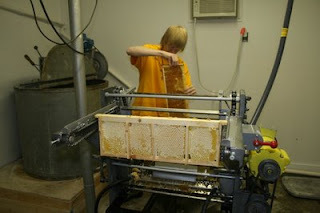 Here's my middle son, Seth, helping extract our first run of honey for 2008!! YEA!!! My oldest son and I have made some plumbing changes each year to improve the operation. This year it is working better than ever. So, I just want to bust your bubble if you think we are more than we are. We are a small, family operation, slowly trying to expand. Until we do, we are making do with the resources that God has give us for the moment. 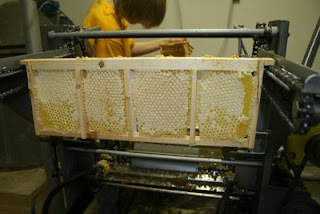 Having said that, let me say we are proud of our humble operation and we do take beekeeping serious. We work hard both in physical labor and in research and development. For example, in trying to come up with a better way to produce comb honey, which is really popular now, my father-n-law came up with the idea of building a frame with wooden pieces throughout the middle. The bees loved it and in one week built this nice comb. I am not going to run it through the automated uncapper. I just placed it there for a picture. 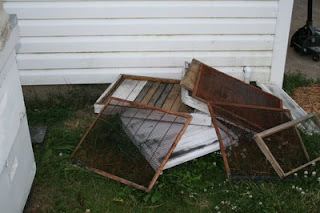 These frames are just empty frames, with no foundation and the bees make their own. Isn't that neat. We've thought about selling these and we have had people request them. Last year, we had some people with arthritis claim that our honey and our honey comb had greatly improved their arthritis. I would not, nor cannot make such a claim but a lot of people do say that about honey. Nonetheless, more and more of our customers are requesting honey comb, they kind we had back in the good ole days. Comb honey is mentioned in the Bible. "Pleasant words are a honeycomb, Sweet to the soul and healing to the bones" (Proverbs 16:24). The Bible does seem to imply that honeycomb brings healing to the bones. So when you visit our honey bee farm, just remember that we're hard workers doing the best we can to keep up with the ever growing demand of helping more and more people enjoy beekeeping! Finally, I'm really proud of my youngest daughter, Karee (pronouced like Marie only with a K). Karee is 17 and has really done well with the queen business. She goes out, cages up the queens and hand picks 4-5 young nurse bees to ride along with the queen to tend to her every need during shipment. She is faster than I am at this. She doesn't get stung at all! One day, she wore no hat or veil either. Way to go Karee. I keep telling Karee that she can continue to make queen rearing her lifelong business. Especially starting so young. 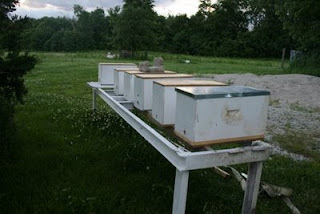 Our next lesson will be on how to manipulate your frames to help your hives expand and get those two deeps built out and that honey super filled up. See you then. And if you don't see what you need on our website, just give us a call, as we sell anything you need related to beekeeping! Call us at 217-427-2678 and don't forget to sign up for our upcoming classes. See our last blog entry for info on the classes. "If I were a rich man, and I'm not, I would buy a house somewhere else, and move there and drive over here to do all the bee work." If I were a rich woman, and I'm not, I would buy a house in the country and have bees. If I were to have bees where I live I would have every neighbour and their cousin wanting to sue me for bee stings etc... I wish I had a place were I could keep bees.